Your software is always up-to-date. Providing you with the most recent software releases and upgraded features at no cost allows you to stay ahead of the pack. When you are enrolled in PMP you receive free upgrades to ThinManager, ThinServer, ACP firmware, terminal capabilities database, and touchscreen drivers. We provide a single source for all of your support needs. Our goal is to minimize downtime and maximize efficiency. That's why our tech support department is run by the same people who develop ThinManager. Your call will be directed quickly to a friendly, knowledgeable member of our tech support team to assist you with ThinManager in order to increase your daily output. We are here to work with you every step of the way. From purchase and license activation, to installation and configuration support, we provide training, consultation, and updates to help you achieve the highest possible return on your investment. We are constantly offering live webinars and training videos to maximize your operational efficiency. You even receive discounts on ACP ThinManager events. We support your company by supporting our product. With 13 years of experience developing and supporting the ThinManager software platform, we know how to best provide timely and professional assistance. Support is available via telephone or Email. By contacting our support team for your ThinManager software or hardware related issues, you will have access to the best assistance money can buy. 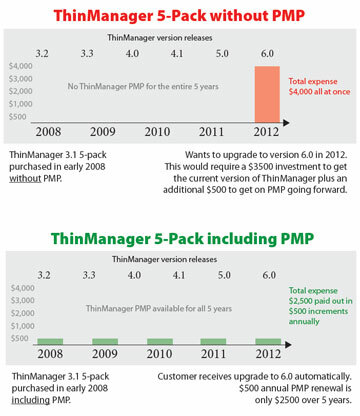 The ThinManager Platform Maintenance Plan entitles a customer to one year of technical support. Phone support is available between 9 A.M. and 5 P.M. EST, Monday through Friday, normal holidays excluded. After-hours and on weekends, a Platform Maintenance Plan customer can leave a voice message for support or send an e-mail. An ACP technical support representative will return the call on the next business day. ACP supports ACP ThinManager, ThinManager Ready hardware, and ACP Thin Client systems. We reserve the right to refer terminal server application issues to the appropriate application vendor. Customers who have a Platform Maintenance Plan receive free upgrades to ThinManager, ThinServer, ACP firmware, terminal capabilities database, modules, and touchscreen drivers.